At Beverly Manufacturing, we pride ourselves on making the highest quality products for the automotive, industrial and janitorial trades. We have been manufacturing lambskin products for more than 55 years. 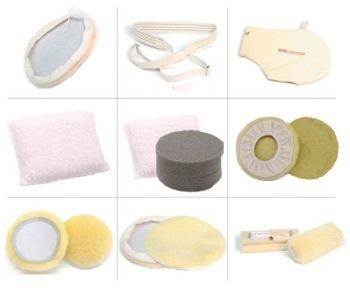 At Beverly Manufacturing, we manufacture lambskin polishing bonnets, lambskin pads (disk type), hook & loop lambskin disc, 100-percent wool-pile polishing bonnets, synthetic polishing bonnets and many more lamb skin products. Foam polishing and compounding pads. Lambskin and synthetic wax applicators and refills. Floor machine pads and bonnets. We do custom sewing, specializing in lambskin products and also produce polished bonnets for the RV and car industries. Contact us for quotes/estimates and a list of other products. LaBelle Holdings, Inc./Beverly Manufacturing has been added to your trip.